We have posted many times about the West 13th and Washington negotiated public space location. 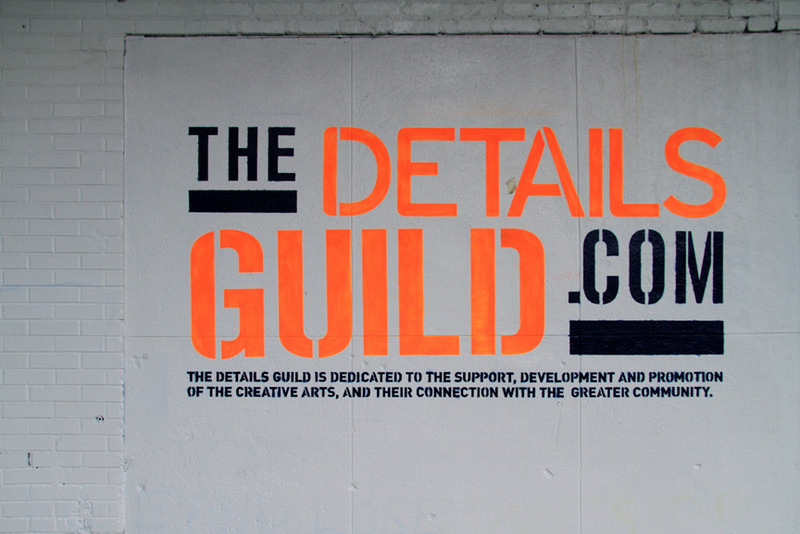 Through the years it has gone from being a fantastic mural by Conor Harrington, to being covered by NPA, only to be uncovered by DickChicken and myself, to then being wantonly destroyed by commercial media, to its newest incarnation as the Details Guild operated "art" location it is now. The history of this location was told to me by Sol Joseph of Critical Massive in a conversation we had months ago, out of which I came with a deep respect for his particular business. From what I understand at this point, the landlord has approved the Details Guild to curate this location for an undetermined amount of time. 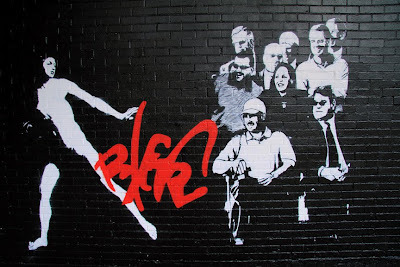 They will provide artists (Blek Le Rat being the first) with month long runs at this location in exchange for bragging rights and a large advertisement for themselves, branding both the art and that corner forever. 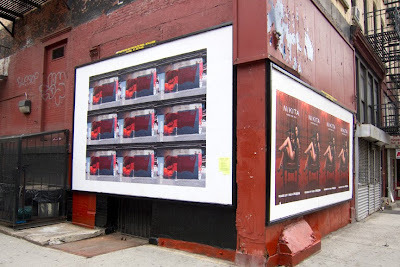 Sales of prints will be offered through their website, all proceeds of which will go to teen arts mentoring programs. While I have been watching this location for some time now, obviously I am opinionated about its use. I have decried its use for advertising, and one would imagine it's transformation into a curated art location would gain my approval. Yes and no. First, the initial outlaw quality that this wall possessed was for me its best incarnation. 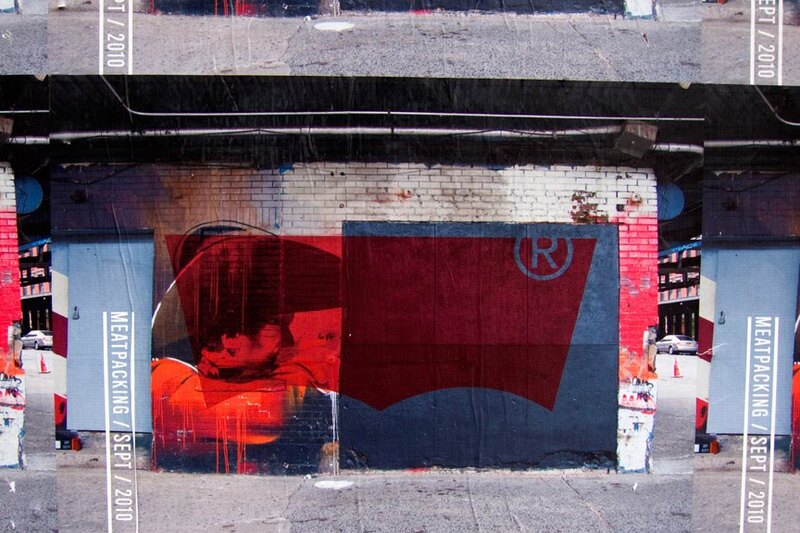 Without true authorization this wall saw a constantly evolving array of artworks and public discourse. 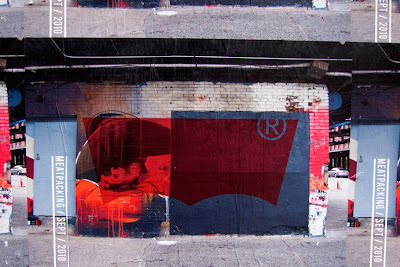 In fact, Conor Harrington's mural lasting so long at a location whose ownership was constantly under negotiation, exemplified some of the ideas I have about unauthorized use of public space and artist's ability to self police critically. Conor's mural lasted a long time without anyone destroying it and this is a testament to the level of respect and concern public citizens had for the piece. It is also proof that allowing the public to self curate their own walls may not result in the widespread destruction that many critics of this practice assume. Although I am happy to see art finally triumphing at this location, as is often the case this tenuous situation is mitigated by a corporate identity. Details has branded this wall and by extension all artists who then use this space in an effort to either promote Details magazine, or sell prints for charity-depending on how you see it. (They did keep the corner part of this wall for themselves) What is lost in this situation is the public's role in actively engaging their own spaces. 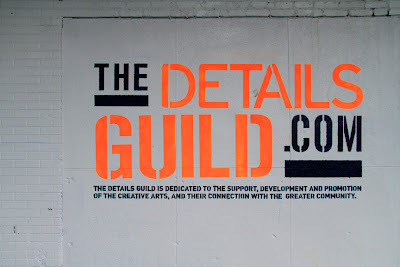 The Details Guild may edit content, choose safe artists, and generally make their own private call on what is appropriate at this location. They will use the streets of our city to benefit their company, re imagining themselves as an institution "dedicated to the support, development, and promotion of the creative arts, and their connection with the greater community." What we loose as a public is an opportunity to have a wall for ourselves. A place in which we can mark the city and by extension become closer to it, physically and emotionally invested in the space that we occupy. While I am all for public arts projects, murals and other forms of authorized public works, this situation leaves much to be desired. Lastly I would like to make a quick observation. It seems NPA, or Contest Promotions as they are now known is "advertising" this location at many of their illegal street level advertising billboards. While I am unsure if there is any connection here between Levis and the Details Guild, any connection will only make this location more suspect and support the thought that what was once a public venue for artistic expression is now a street art advertising spot slyly hidden beneath a public arts project.